You must start with the Path of Light level first. Each level takes about 8 months to complete. Practical information on Energy, Souls and Monads, The Light Body, Aspects, Chakras, Sensory Gifts - clairaudience, clairsentience and clairvoyance. Tools of Assistance section with 16 chapters - Chakras, Universal Rays, Universal Laws, Basic Energy Work,Psychic Protection, Clearing Space, Crystals, Vibrational Essences, Light Technology, Ascended Master Tools, Decrees, and Affirmations. 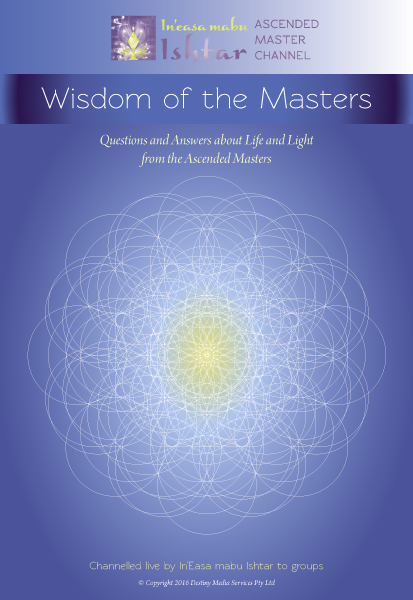 43 answers to questions from the Ascended Masters. COST: AUD$180 plus $25 postage & handling (+10% GST for Australians). If you order 2 or more we will need to send you a shipping cost via email. COST: AUD$180 plus $65 postage and handling per manual. If you order 2 or more we will need to send you a shipping cost via email.